The late Ferdinand Marcos Sr. became the President of the Philippines in 1965 where the country has become one of the great models of political and economic success. Marcos in his time has also widely acknowledged as one of the most brilliant lawyers and political leaders and was unseated through a People Power Revolution in 1986. Veteran Manila Times columnist and former Filipino diplomat Rigorberto Tiglao had once again made another shocking revelation in regard to the human rights record abuses occurred from the former administrations of Marcos Sr. and Corazon Aquino. In his column in The Manila Times, Tiglao wrote his piece entitled "US scholar: ‘Human rights abuses’ under Cory worse than under Marcos" which details how human rights abuses during the regime of Cory Aquino are worse than of what the critics most-used figure to allege  the ruthlessness of the Marcos dictatorial rule. 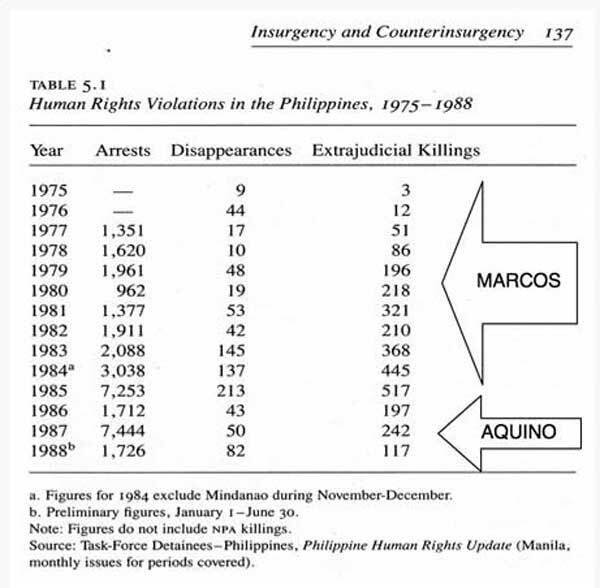 Tiglao has supported his piece with the presented data from Richard Kessler’s book Rebellion and Repression in the Philippines (1989: Yale University) showing that cases during Cory's regime human rights abuses was indeed worst as shown in the figures as compared to Marcos' rights abuses. In the data figures which will be shown below is a clear evidence that human rights abuses continued under the regime of late President Cory Aquino. It has also shown how bad the human rights situation really was during the comparative governments and evidently displays abuses really did not cease with democracy’s return but may have seemed even worsened. JUAN Ponce Enrile’s recent claims on Martial Law in his interview by Ferdinand Marcos Jr. has thrown the Yellows and Reds into paroxysms of rage against the respected senator. The unkindest comment was from the editor in chief of Philippine Star who, instead of presenting facts to debunk Enrile’s claims in her column, branded him “a senile man with symptoms of dementia” who “should be tossed into a regular jail pronto. Such is the sad state of journalism in this country. Such vitriol is proof of Jose Ma. Sison and his Communist Party’s victory in having Filipinos toe their propaganda line, helped by the Yellow Cult. Lazy or naïve journalists — and unscrupulous ones fabricating false data — have swallowed the lie. A CNN Philippines article was entitled “8 things Juan Ponce Enrile, Bongbong Marcos got wrong about martial law.” There it claimed: “More than 3,000 were killed during the Marcos regime, data from human rights group Amnesty International show.” I have copies of the AI reports from 1974 to 1981: Nowhere did the AI make that claim. The biased-for-the-leftist-view report of course didn’t report the actual AI phrase which was “reportedly admitted,” which means it was hearsay on the part of AI. It also didn’t quote the very next sentence after that: “Mr. Enrile also said some colonels and other high officials had been court martialed.” That is evidence that there was no state policy for torturing dissidents, but did occur as aberrations that happens all the time in all countries during armed rebellions. 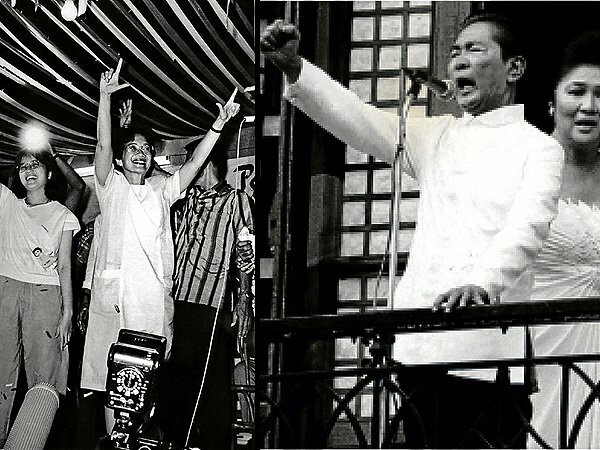 We will never mature to become a strong nation if we refuse to accept facts that give us a different interpretation from the narrative victors of a particular political clash have disseminated — in this case the account of Martial Law propagated by the Yellows and Reds who toppled Marcos in 1986. Totally ignored in the allegations of massive human rights violations during the Martial Law period is the undeniable fact that the Communist Party and the Moro separatists waged an armed war against the Republic. While there were indeed tragic horrific cases of military and police abuses against civilians, inevitable in all armed conflicts since ancient times and in every country that experienced such wars, most of the so-called killings and human rights abuses were casualties in this war launched by communists and Moro separatists against the State, which of course defended itself. Proof of this is that even after Marcos fell in 1986, such “human rights violations” continued, as Cory Aquino helped the insurgency to surge, naively believing the communists who fought Marcos would continue to be supportive of her. Such violations were during the regime of Corazon Aquino, purportedly the icon of Philippine democracy whom a few fanatics even lobbied the Vatican to declare a saint. Such a conclusion isn’t just my opinion. It is based on data presented in Richard Kessler’s book Rebellion and Repression in the Philippines (1989: Yale University). Kessler is an American national security and foreign affairs expert. His last position before he retired recently was director of the US Senate Committee on Homeland Security and Governmental Affairs. Kessler’s data, however, doesn’t really report “human rights violations” as usually defined as those against innocent civilians, but reflect the arrests and casualties of the NPA and its other fronts, since these were reports by the Task Force Detainees, which the communists set up and controlled. Kessler presented data in his book to point out that “human rights abuses” — i.e. casualties in the insurgency — had not at all subsided even after Cory Aquino assumed power until 1988, the last year for which data was available. International groups, such as Amnesty International and the Lawyers’ Committee for Human Rights, issued reports in 1988 that suggested that the human rights situation (under the Aquino regime) was “at least as bad as it had been under Marcos” (emphasis mine). As table 5.1 indicates, human rights violations — always a problem in the Philippines — did not cease with democracy’s return.” (p. 136). However, we would just be making an inane apples-and-oranges comparison if we just looked at the totals, since these do not take into account the fact that the Marcos cases span 11 years against Cory’s three. To evaluate how bad the human rights situation really was during the comparative regimes, the average per year should be taken for the years under Marcos and those under Aquino. There were three times more arrests per year under Cory than under Marcos: 3,627 against 1,960. The average of those killed and disappeared during Cory’s watch was 244 annually, which isn’t too far from Marcos’ 296. “In April 1987 a member of the United Farmers’ Organization was kidnapped by a local vigilante in Cebu City, her body, with her head and leg hacked off, was recovered over a week later. In May, a 30-year-old woman, eight months pregnant, and another young woman, disappeared. Their bodies were later discovered, headless and stabbed multiple times. That pregnant woman’s abdomen had been slashed open and the fetus ripped out. One day in June, a farmer hoeing his field in Negros was attacked by several vigilantes, who accused him of being a communist rebel. He was decapitated and disemboweled. They took the head to the local military commander who told them that the man was innocent. The head was abandoned in a ditch, to be recovered later by the man’s wife” (Kessler, page 136).